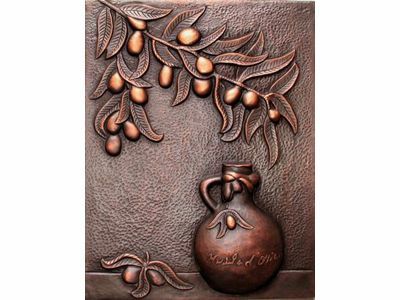 This 16'' x 12'' copper mural, shown here in Coffee patina with fruit in New Penny patina, can be used as the centerpiece in your tile or stone backsplash above your range, in your shower, as a cabinet panel, or anywhere you want to add the unique elegance of copper to your home decor. We create custom sized and custom designed murals! Send us high-resolution close-up photos of any design; our world-class copper artisans will immortalize it in copper. Call or email us for more details.